Tittensor D.P., Walpole M., Hill S.L.L., Boyce D.G., Britten G.L., Burgess N.D., Butchart S.H.M., Leadley P.W., Regan E.C., Alkamade R., Baumung R., Bellard C., Bouwman L., Bowles-Newark N.J., Chenery A.M., Cheung W.W.L., Christensen V., Cooper H.D., Crowther A.R., Dixon M.J.R., Galli A., Gaveau V., Gregory R.D., Gutierrez N.L., Hirsch T., Hoft R., Januchowski-Hartley S.R., Karmann M., Krug C.B., Leverington F.J., Loh J., Lojenga R.K., Malsch K., Marques A., Morgan D.H.W., Mumby P.J., Newbold T., Noonan-Mooney K., Pagad S.N., Parks B.C., Pereira H.M., Robertson T., Rondinini C., Santini L., Scharlemann J.P.W., Schindler S., Sumaila U.R., Teh L.S.L., van Kolck J., Visconti P., Ye Y. In 2010 the international community, under the auspices of the Convention on Biological Diversity, agreed on 20 biodiversity-related “Aichi Targets” to be achieved within a decade. We provide a comprehensive mid-term assessment of progress toward these global targets using 55 indicator data sets. We projected indicator trends to 2020 using an adaptive statistical framework that incorporated the specific properties of individual time series. 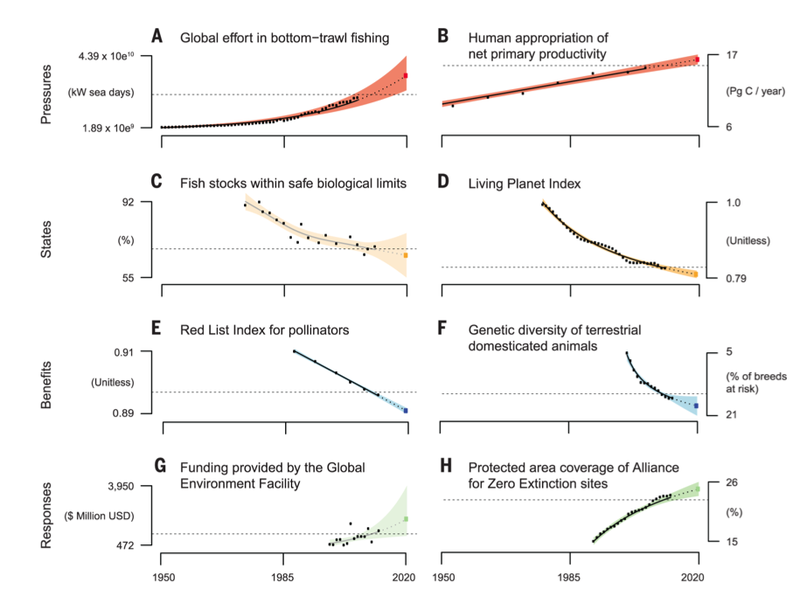 On current trajectories, results suggest that despite accelerating policy and management responses to the biodiversity crisis, the impacts of these efforts are unlikely to be reflected in improved trends in the state of biodiversity by 2020. We highlight areas of societal endeavor requiring additional efforts to achieve the Aichi Targets, and provide a baseline against which to assess future progress. This entry was posted in Lab by oritteropus. Bookmark the permalink.